Quite frankly, it is extremely easy to transform your bathroom into the spa of your dreams. And with a little inspiration and a few colour and theme suggestions, you will a uniquely awesome bathroom. In fact, there are a huge variety of colour schemes that will easily fit your style and décor. A creamy white that sooths your soul after a long, hard day. This bathroom is sublime in mood that takes you away from the busy and flamboyant world. The soft light grey walls intersperse naturally with a classic double vanity in bone china tones. The room is complete with a marble counter that sparkles against the area’s buttery trim. Typically bathrooms are camped with corners that have limited roof space. These eaves can be nicely veiled by covering it with patterned designs such an aviary print that opens up the entire area. Add some matching accents like a corner vase with peacock feathers to finish off the look. 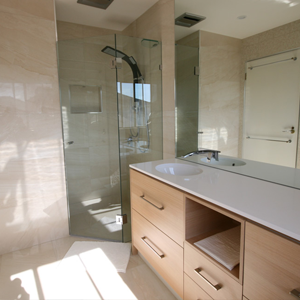 When a bathroom seems awfully small, the best way to open up space is to install glass windowed shower doors. Not only is there an illusion of a bigger room but the glass reflects light making the space even larger. And to add a nice contrast, have you main focal point be a black tub with steel fixtures. River rocks are the perfect material for bathroom flooring. They complement most any style. However, textures and various gray colors are perfect for a Spanish style home. Select a shower door with a metal casement window with modern day fixtures for eye-catching appeal. Antiques are always ideal for the bathroom. For stunning 19th century appeal, combine a lovely zinc tub with a patina full basin sink. 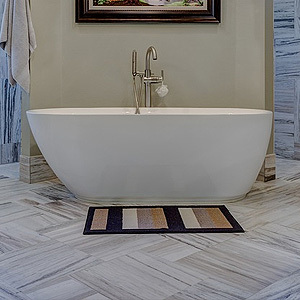 Surround the striking tub with a trinity of windows or mirrors. Complete the room with a lovely 1850s vanity, towel rack and antique style throw rug. Inspired by the five star Parisian hotel of tiled floors and French fancies, this bathroom tops them all. Bring the elite right into your home with the use of tiled mosaics throughout the room. The bathroom is swathed in marble and has a 18th century chandelier overhead. Kids will adore a fanciful bathroom with a themed animal such as a zebra. Plus it is classy enough where adult enjoy its whimsical pizazz. Try an uncommon combo of creative zebra wallpaper and graphic Escher painting tiles. The kitchen can be one of the most inspirational rooms in your house, and, since family members spend a considerable amount of time here, it should be as aesthetically pleasing as it is functional. So, when it comes to kitchen flooring, choosing a material that will add beauty and aesthetics to your overall design just makes sense. It does not get any classier than this. Traditionally, kitchen floors have been made of timber, and of late, this interior style has come back. A lot of home owners consider hardwood timber as an ideal option for its durability, aesthetics, and long-lasting nature. Often, people choose a wooden theme for their kitchens, or they simply choose a distinct wooden floor to go with an existing theme. The only real downside is that timber floors can be more expensive than other flooring, but in the long-run, it is an investment that increase a home’s value. Over the years, laminate has proven to be a more functional and Eco-friendly flooring option. The top layer of this material is made from composite wood pressed together, this is done at high temperatures to achieve the look of timber. Laminate is roughly half the price of hardwood flooring, which makes it an affordable options. If there is any material that can outlast timber flooring, its concrete. Concrete is a more modern approach to flooring and it is impressive how it can be decorated in any colour, to match nearly countless interior design themes. Concrete comes with many benefits, it is moisture and impact resistant. So, basically, you won’t have to worry about it being damaged by dropping things on it. Tiles are another great choice for kitchen flooring, there are many types and designs, and these can withstand water, spills, and heavy foot traffic. Tile will not absorb any bacteria or odours, and it can go with any interior design style or decor. There are many flooring options available when renovating your kitchen. 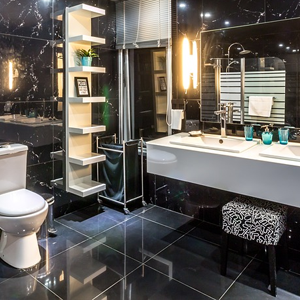 If you aren’t sure which type of material to use that will add beauty and aesthetics to your overall design theme, then visit the showroom at Concept Bathroom & Construction. You will be amazed to discover the decorative possibilities that are available for kitchen renovation. Renovating your bathroom and kitchen can bring new life to your living space. It can add convenience, comfort, lifestyle and panache to your home. Regrettably, a renovation can take a lot of time, labor and money. But it can also be a rewarding experience that is stress-free. And with a few helpful tips, you can be rest assured that your renovation runs smoothly. Many experts agree that a financial plan is needed before you start any type of renovation. Having a financial plan can also help with deciding on what you want renovated and its importance. The plan needs to have an estimated or exact cost for everything such as labor, materials, appliances, updating fixtures and other expenses. Also, do not be afraid to readjust the budget if prices are higher than expected. Just make a list of your priorities to help you decide what is most important. A definite plan on exactly what you want is highly important. This will help you stay on track and not go off budget. A plan entails many variables like pricing items, selecting the best products, measuring space plus the time allotted to complete the project. In addition, your budget should include additional money for any hidden costs that you may have overlooked. The last thing you want is to run out of funds before the renovation is completed. Renovating your bathroom and kitchen can be a very exciting experience. Some home owners are tempted to tear everything out and start over such as the flooring and counter tops. In addition, the numerous options for designing can be inspiring. It is easy to get carried away and start renovating both rooms at the same time. However, if you are residing in the same house that is being renovated, it is best to start and finish one project at a time. For instance, you may decide to install all new appliances and fixtures like the shower and sink faucets. Instead, renovate one bathroom at a time. That way one of the facilities is functional while to other is being upgraded. This is especially convenient if the fixtures you ordered are delivered late. Although it may be tempting to do the work yourself, it the long run it is more cost effective to hire an expert. And when it comes to renovating your bathroom and kitchen you want to hire the very best. Someone experienced will have the know-how and expertise to get the job done right. And aside from saving you time, a professional will make sure that your renovation is stress-free and up to standards. An ideal time to green up your kitchen is during a renovation project. Eco-friendly ideas for this room have come a long way in recent years. They range from the cabinetry materials to the latest in lighting options. You will leave less of a carbon footprint on this planet while you conserve energy. All of this and your kitchen will still be as functional and as attractive as you need it to be for you and your family. Read additional facts about how to create an environmentally friendly kitchen in the details here in our information. Use materials for your cabinets that are from sustainable forests or are recycled from previously used sources. For example, your present cabinets may just need to be refinished to update your kitchen instead of professionals building new ones. Of course, you can select from a number of local types of sustainable timber when your cabinetry requires replacing as part of the remodel. In addition, the materials in your cabinetry should emit as little formaldehyde as possible. To ensure this, search out materials with an E-zero rating. The finishes on the cabinets should be low in volatile organic compounds of VOCs. Water-based sealers and stains, and low-VOC paints are the best choice of finishes. Update your appliances with current models that carry an Energy Star rating. These will operate efficiently without being energy hogs. Replace your outdated incandescent light bulbs and fixtures with the latest in light-emitting diodes or LEDs. While these provide effective illumination for food prep and eating, they do so by using a less energy than the incandescent options do over time. On top of this, you will not need to change out LED bulbs as often, therefore, reducing the cost of buying replacement ones over the years. Our experts here at Concept Bathrooms & Construction can guide you further on this topic. 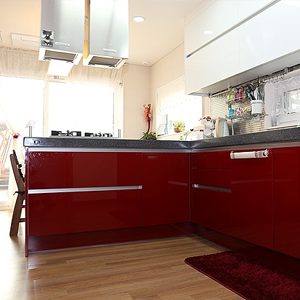 We will provide you with highly functional, attractive and eco-friendly kitchen renovation results. Today, homeowners across Australia are trying to build homes that impact the environment as little as possible. For example, when designing a bathroom for their house either as a construction or renovation project, they are discovering ways of greening their bathrooms to achieve an eco-friendly ambiance in this room. You may be in the midst of such a project at present and might need a bit of guidance on how to achieve this ambiance effectively. Luckily, we offer you four ways to obtain a green bathroom in the facts that follow. Top on the list for greening a bathroom is the installation of toilets and tapware that function in a water-conserving manner. Low-flow toilets require one-third if not less of the water of high-flow toilets do to flush. They not only preserve a valuable resource, but also they allow your water bill to be less, which saves you money. For the shower, select a low-flow shower head and at your sinks, install motion-sensing mixers or other tapware to conserve water. Green light options include LED and CFL bulbs, both of which use less electricity than the old-time incandescent bulbs do and therefore, are the better choice for an eco-friendly bathroom design. In addition to using less power to provide illumination, both of these styles of bulbs last much longer since they do not burn out as quickly as incandescent ones do with their filaments. All of this means that you will save money on your power bill and on light bulbs over time due to the fact that you will not be purchasing them as often. Whenever possible, ask for sustainable or recycled materials for bathroom features, such as flooring, wall tiles and cabinetry. Timber from sustainable sources throughout Australia is possible today for the construction of your custom cabinets as well as other elements in this room. Flooring options can include recycled materials ranging from wood to clay tiles, and the wall tiles can be of recycled glass or glass tiles. In addition, you can recycle materials from your outdated bathroom to green up your remodeled one. Another way to ensure that your bathroom is as green as possible is to use finishes and other materials that give off low or no volatile organic compounds or VOCs. An example of these elements is formaldehyde, which can negatively affect your health when you inhale it. Concept Bathrooms & Construction will assist you with further facts on greening your bathroom for an eco-friendly ambiance upon request. We are experts in domestic construction and renovations for all areas of your home. Our company promises to deliver quality results and backs all our work with a guarantee of satisfaction. When planning the type of kitchen that is ideal for your house, there are numerous possibilities to consider, including the modular kitchen style and design. While this option is growing in popularity with homeowners, you may be hesitant to select it since you do not understand all the pros and cons about it. We are here to help with this fact with the following advantages and disadvantages on the modular style of kitchens. 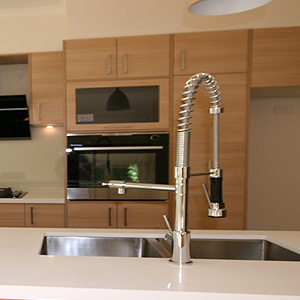 Every feature of a modular kitchen is customisable to suit your preferences. You select the colours, materials and finishes that go into each module. In addition, unlimited configurations are possible with this design. Assembly is a breeze with this type of design. This is especially beneficial during a remodel since it means that you will need to go without the use of your kitchen for a lesser amount of time than with other types of kitchens. Modular design elements complement modern decor with their sleek, simplistic lines and features. Even the hardware accessories follow suit with these characteristics. Your modular kitchen will be made according the specifications and measurements of your house’s kitchen space. For this reason, all the units will fit perfectly without the need for adjustments. If you have a limited area for a kitchen, the modular style conserves space while it provides you complete functionality. The design of the modules will not waste precious floor space in this instance. You also can install a modular kitchen in a large area. One disadvantage to this style is the fact that it is an expensive kitchen option since the craftsmen custom make each piece. The cost of maintaining a modular kitchen is high. Although, you can replace units easily if damage happens, the price of ordering and installing them is expensive. For further facts about the modular kitchen style and design to learn if this is the right way for you to go for your home, contact Concept Bathrooms & Construction. We are experts in our field and will deliver high-quality results. Our company also stands behind our work with a written guarantee. You have almost unlimited options for decorating your bathroom shower today, including tile. Tiles come in a wide assortment of colours, sizes, styles, textures and even materials. All types of bathroom shower ideas and accent designs can result by installing one or more together according to your preferences. We share some suggestions below with you about how to use tiles in your shower. Install tile from floor to ceiling on all the shower walls to turn the area into an attractive focal point in your bathroom. By doing this, you will transform the entire room into an oasis rather than just a functional room for grooming. Other configurations for the tiles are possible in case you wish to have the upper area of the shower walls to be painted and the lower area to contain tiles for an example of what we mean by this. While you may select to install the same type and colour of tiles on the walls of the shower, you also may desire to include accent designs with complementary tiles of a different style or colour across the top, middle or bottom of the walls. In addition, you can scatter design patterns periodically throughout the walls. You can select to tile the floor of the shower along with the walls. The important thing here is to select a tile that is rated to be as slip-resistant as possible. While slip-proof tiles do not exist, each type of tile carries a rating on how high the risk of slipping on the tile is when it is dry or wet. For this reason, you may need to install a different tile on the floor than you do on the wall unless the floor tile suits your purposes for both areas. This is not a problem, though, as different tiles on the wall from the floor will add a special dimension to the area. Along with these types of tile, you will see size variations in each and other categories from which to select depending upon the manufacturer. For further information about bathroom tile shower ideas and accent designs, consult with Concept Bathrooms & Construction. We will provide you with quality results each time that we perform a project for you. After years of use, it is not uncommon for cracks and holes to appear on ceramic bathroom tile floors. Not only does this damage cause the floors to have an unsightly appearance, but the cracks and holes can create sharp edges on the tiles that can harm people’s feet when they enter the room with bare feet to take a bath or shower. To remedy this situation, you will need bathroom repair and renovation techniques to restore the floor to a safe and attractive condition. At times, a patch job is sufficient, but at other times, you will need to replace the entire floor with new ceramic tiles. When the damage is minor, repairs will be enough to restore the bathroom floor, especially if you have extra tiles left from the original install or the cracks and holes are just in the grout. You will need an in-depth solution, though, if the damage is major, as we discuss in the next section. If the tiles suffer from severe damage or you do not have any of tiles on hand from the original installation, a repair job will be inadequate to fully restore the condition of your bathroom. The entire tile floor will need to be removed to make way for a new one. Professionals will perform this task adeptly and install a fresh base on which to adhere to new tiles too if necessary. After this, they will adhere the tiles in the proper configuration and manner to secure them. Grout is the finishing stage of a tile floor to fill in the spaces in between the tiles. Once the tile adhesive and grout dries, the floor only requires a quick cleaning to be ready for use. If you indeed do require a total renovation of your tile bathroom floor, consider updating with the latest in ceramic tiles. Styles have changed over the years to offer you innovative flooring results. Explore the numerous options in these tiles before you select the one that is right for your specific bathroom. You even can mix different styles and colours together to create a look that is unique. To ensure that you receive only quality bathroom repair and renovation on your ceramic bathroom tile floors, contact Concept Bathrooms & Construction. We restore ceramic bathroom tile floors back to their former glory, according to each one’s specific needs. When you leave a vehicle out in the elements in between uses, the UV rays and other weather happenings can fade the paint job or even harm the body of the vehicle in serious ways, such as dents from hail. The solution for this issue is to either expand an existing garage or to build a new one through a home extension project. At times, you may not have sufficient room for both of your vehicles while at other times, you might lack the presence of a garage on your property. All sizes of garages are possible, whether you need to house one vehicle or a dozen. You just require enough space on your property to construct the size of garage that you desire, and the right plan to make it come to fruition. Of course, your budget will come into play here since a more expansive size equals a higher cost. 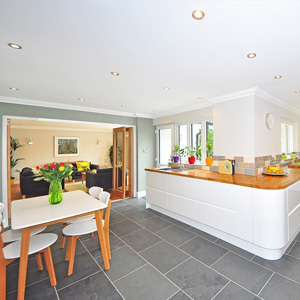 Match the design of your home with your garage as a home extension project. Whether your house is modern, traditional, country, contemporary, rustic or eclectic in design, a garage is possible in a complementary style. A garage that blends well with your house’s style preserves the aesthetic appeal of your property better than one of a different style. Roofs for garages come in flat, gabled or custom styles depending upon your needs. Which style is best for your situation, depends mainly upon the style of your house. For example, either style will work with modern, but a gabled roof is ideal for traditional. If you need a garage for other uses than just storing your vehicles, there are a number of different ways to enhance one. You can add pegboards for storing tools, a workbench of constructing DIY projects, a storage area for a lawnmower and your gardening equipment, and even a chair to sit in when necessary. Overhead storage is also possible for seasonal equipment, such as kayaks, paddles or skis. Contact Concept Bathrooms & Construction to design and build your garage for you. 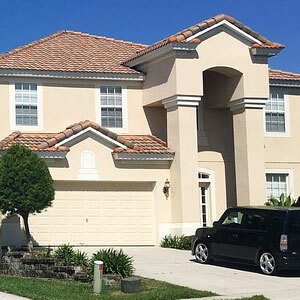 We will create this home extension project in such a way that it includes all the features that you desire in it, and with only quality workmanship and materials. Meet with our staff soon to receive a free quote of our services on this project. As part of updating your present bathroom, you need to select your preference of the modern bathroom colour schemes that are popular today. With the right colours, you will set the overall mood of the room to suit your personal usage of it. You can select to use a single colour for the walls, countertops and floors for a monochromatic effect or you can combine different shades that complement each other to enhance this room. Shades of blue provide the same calming feeling one may receive when admiring a sea or ocean. These shades for a modern bathroom range from aqua to deep purplish-blue. Consider one of these shades if you use your bathroom to melt away your problems while you soak in the tub. 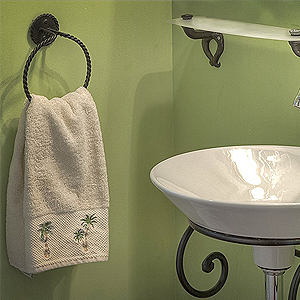 Tones of green bring a natural ambiance to the bathroom similar to the lush green lawn offers your yard. Green is as calming as blue is to remove the stress of the day. Shades range from pale to grass green. When in need of a colour scheme with a masculine twist, consider tones of gray. You even can mix these tones with brown tones, such as those in a simulated timber floor. If you seek a neutral colour scheme, consider shades of tan. All types of bathroom elements from countertops to paint shades come in this colour. Using black and white together broadcast a bold statement since these shades are exact opposites of each other. When you add towels in the same colours to the room, the modern effect will astound you. Red is the perfect colour to provide you mental stimulation first thing in the morning. Medium to deep shades of this colour increase your mental activity and heart rate. Going with an all-white scheme gives your bathroom a simple elegance. Achieve this not only with paint and fixture colours, but also you should add white floor and countertop options, such as marble. Add the above colour schemes with natural wood grains in the custom cabinetry for an earthy feel to your bathroom on top of the other effects that you can achieve with the colours. Consult with Concept Bathrooms & Construction for further details on these and other modern bathroom colour schemes and all of our services.